Are you based in NSW or ACT, part of an Intrepid Landcare group or Landcare / environmental volunteer group which is working with young people? Or keen to step into volunteer work for the environment? 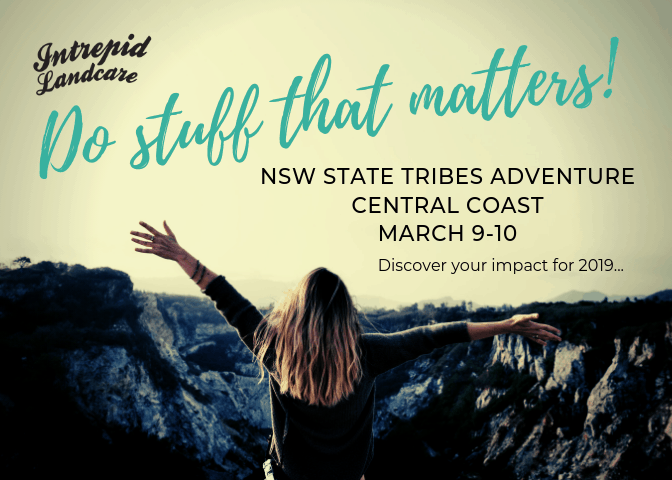 Then you are invited to our NSW State Tribes Adventure over the weekend of the 9th* to 10th of March at Camp Kariong on the Central Coast NSW (ACT people also welcome). *You are most welcome to arrive on the 8th to set up camp and hang an extra night. Hunter Intrepid Landcare with funding from Hunter Local Land Services is helping to cover the costs of this event to make it free! We will be hanging out with some epic leaders who will take us on some local adventures, share cultural knowledge and we’ll get our hands dirty with Clean4Shore to look after the local environment and discover ways you can have a positive impact. This weekend will be all about having an awesome experience in nature while looking at the impact you want to have, and creating the projects that you want to show up to. Gaining focus and purpose – how the hell do I choose what stuff to do and where do I even start!? You have been thinking of volunteering with Intrepid Landcare and 2019 is your year! More details on the itinerary will be uploaded in the coming weeks. What do we mean by ‘young’ here? Anyone aged 18 to 30’s. All activities will be free! There will be treated drinking water, fire pits (and wood) available for a camp fire (if conditions allow), there are trolly’s to walk your gear into the camp site available (this may be a few hundred meters away from the car park. It is a remote area. To RSVP for this event get yourself a Stickyticket HERE ASAP, there are limited places so get in quick!